Sigurd Ring (Old Norse: Sigurðr hringr (born c. 750 AD) was a legendary Swedish king mentioned in many old Scandinavian sagas. According to Bósa saga ok Herrauds, there was once a saga on Sigurd Ring, but this saga is now lost. In the old sources, he is notable for winning the Battle of the Brávellir against Harald Wartooth and for being the father of Ragnar Lodbrok. The Hervarar saga tells that when Valdar died, his son Randver became the king of Sweden, while Harald Wartooth became the king of Denmark. Then Harald conquered all of his grandfather Ivar Vidfamne's territory. After Randver's death, his son Sigurd Ring became the king of Sweden, presumably as the subking of Harald. Sigurd Ring and Harald fought the Battle of the Brávellir (Bråvalla) on the plains of Östergötland where Harald and many of his men died. Sigurd ruled Sweden and Denmark until his death and was succeeded by his son Ragnar Lodbrok. Harald Wartooth's son Eysteinn Beli ruled Sweden as a jarl until he was killed by the sons of Ragnar Lodbrok. 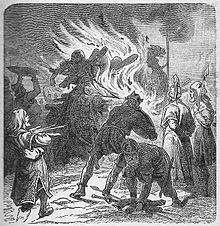 In Sögubrot af nokkrum fornkonungum, Sigurd is the paternal nephew of the Danish king Harald Wartooth, and presumably (the part of Sögubrot where this would have been narrated expressly has not been preserved) the son of Randver, who in his turn is the son of Harald's mother Auðr the Deep-Minded and her husband king Raðbarðr of Gardariki. Harald Wartooth was beginning to feel old, so he made Sigurd the king of Sweden and Västergötland. Sigurd beat his uncle at the colossal Battle of Bråvalla, and became the ruler of Denmark as well. He made a shieldmaiden the ruler of Denmark (cf. Chronicon Lethrense, below). Sigurd married Alfhild, the daughter of king Alf of Álfheimr and their son was Ragnar Lodbrok. As Sigurd grew old, distant parts of his realm began to secede, and it is told how he lost territory in England due to old age. One day, he was in Västergötland and was visited by his brothers-in-law, the sons of Ragnar. They asked him to join them in attacking king Eysteinn of Vestfold in Norway. In Vestfold, there were great blóts held at Skiringssal. Unfortunately, Sögubrot (meaning the "fragment") ends there. However, the Skjöldunga saga is believed to be the original story on which Sögubrot is based and it continues the story (see below). The Skjöldunga saga tells that Sigurd Hring was married to Alfhild, the daughter of king Alf of Alfheim, and their son was Ragnar Lodbrok. Unfortunately, Alfhild died. When Sigurd Hring was an old man, he came to Skiringssal to take part in the great blóts. There he spotted a very beautiful girl named Alfsol, and she was the daughter of King Alf of Vendel (Vendel). The girl's two brothers refused to allow Sigurd to marry her. Sigurd fought with the brothers and killed them, but their sister had been given poison by her brothers so that Sigurd could never have her. When her corpse was carried to Sigurd, he went aboard a large ship where he placed Alvsol and her brothers. Then, he steered the ship with full sails out on the sea, as the ship burnt. Ragnar Lodbrok succeeded his father, but put a subking on the throne of Sweden, king Eysteinn Beli, who later was killed by Ragnar's sons. According to Gesta Danorum (book 7), by Saxo Grammaticus, Hring was the son of the Danish king Randver and the maternal nephew of the Danish king Harald Wartooth. His father Ingjald had raped the sister of Harald, but the latter did not mind in order preserve the friendship with Ingjald. Ring fought with Harald Wartooth in the Battle of the Brávellir and became the king of Denmark as well. Saxo then describes the different subkings and their adventures. In book 9, he returns to Sigurd Hring as Siward, surnamed Hring, the father of Ragnar Lodbrok. According to Hversu Noregr byggdist, Sigurd was the son of Randver, the brother of Harald Wartooth. Randver and Harald were the sons of Hrærekr slöngvanbaugi. In the part of the Heimskringla called the Saga of Harald Fairhair, Harald Fairhair learns that the Swedish king Erik Eymundsson had enlarged Sweden westwards, until it reached the same extent as it had during king Sigurd Hring and his son Ragnar Lodbrok. This included Romerike, Westfold all the way to Grenmar, and Vingulmark. In Ragnar Lodbrok's saga, it is mentioned that Sigurd Hring and Harald Wartooth fought in the Battle of the Brávellir and that Harald fell. After the battle Sigurd Hring was the king of Denmark, and he was the father of Ragnar Lodbrok. Ragnarssona þáttr only states that Ring was the king of Sweden and Denmark, and the father of Ragnar Lodbrok. In Bósa saga ok Herrauds, it is only said that Sigurd Hring, the father of Ragnar Lodbrok fought with Harald Wartooth at the Battle of the Brávellir where Harald died. It adds that there was a saga on Sigurd Hring (which today no longer exists). According to the Chronicon Lethrense, Harald Wartooth had made all the countries down to the Mediterranean pay tribute. However, when he went to Sweden to demand tribute, the Swedish king Ring met him at the Battle of the Brávellir, and Harald lost and died. Hring made a shieldmaiden the ruler of Denmark (cf. Sögubrot af nokkrum fornkonungum, above). Gríms saga loðinkinna and the younger version of Orvar-Odd's saga only mention Sigurd Hring in a few lines relating to the Battle of the Brávellir with Harald Wartooth. In Norna-Gests þáttr, it is said that Sigurd Hring was very old when Sigurd's sons-in-law, the sons of Gandalf, asked him to help them fight against Sigurd Fafnisbani and the Gjukungs. Sigurd Hring could not help them in person, as he was busy fighting against ravaging Curonians and Kœnir. It has been suggested that a report of a struggle for the Danish crown may have given rise to the legend of Sigurd Hring. Following the death of Hemming in 812, his brother or cousin Sigifrid and Anulo (Latin for Ring, but perhaps originally representing Old Norse Anleifr), nephew or grandson of an earlier king Harald, fought a battle for the succession in which both were killed. This struggle appears to be reflected in the legendary Battle of the Brávellir, fought by Sigurd Hring, nephew of Harald Wartooth. Sigurd Hring appears as a playable leader of pagan Sweden in the "Charlemagne" start date in Crusader Kings II, despite being semi-legendary and a nebulous saeculum. This page was last edited on 31 March 2019, at 20:19 (UTC).